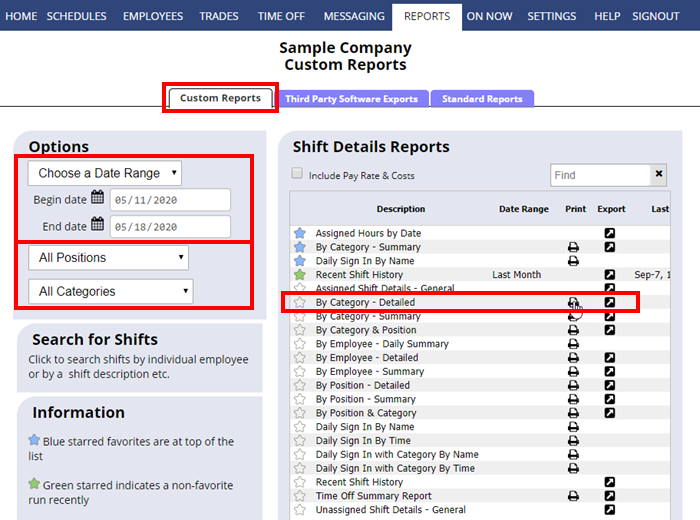 You can create custom reports based on date ranges and what you want to include and then either print the report or export it so that it can be saved or used in other programs. Choose the Position & Category to include and indicate if you want Pay Rate and Approximate Cost to be included. The report page will be opened along with a print dialog window. To view the page, you can cancel the print dialog. To send to printer after canceling the print dialog, you can right click in the window and choose Print. When you run a report it will also then appear toward the top of the list as a yellow starred “recently run” report with the run date. Click the star next to any report to mark it as a “favorite” and it will appear with a blue star at the very top of the list. You can use the “Find” box to locate a report by name.